Help your youngster get the perfect look to let everyone know who she cheers for! She can show off her New Orleans Saints spirit with this Drew Brees Game jersey from Nike. 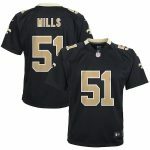 It features printed New Orleans Saints on the front and her favorite player’s name and number on the back. FansEdge is your trusted source for all the latest New Orleans Saints gear.